Retired Maj. James Capers was awarded the Silver Star Medal, the nation’s third highest award for valor, during a ceremony at the MacDill Air Force Base officers club Oct. 27. Capers was one of five Marines from 3rd Force Reconnaissance Company who received awards for valor in combat operations conducted more than 43 years ago. 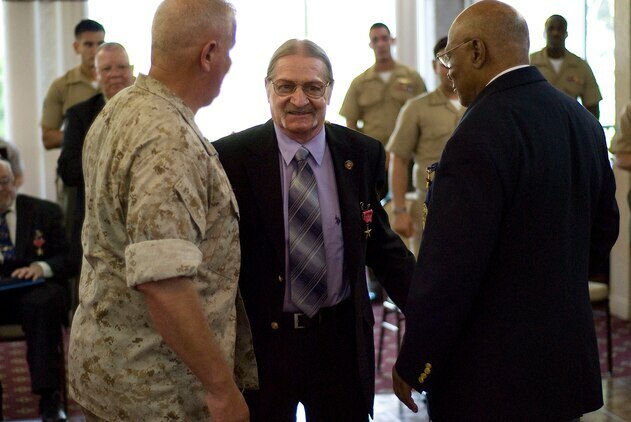 Five Marines and a Navy corpsman who served with 3rd Force Reconnaissance Company in Vietnam were recognized with awards for valor in combat operations conducted more than 43 years ago during a ceremony at the MacDill Air Force Base officers club Oct. 27. 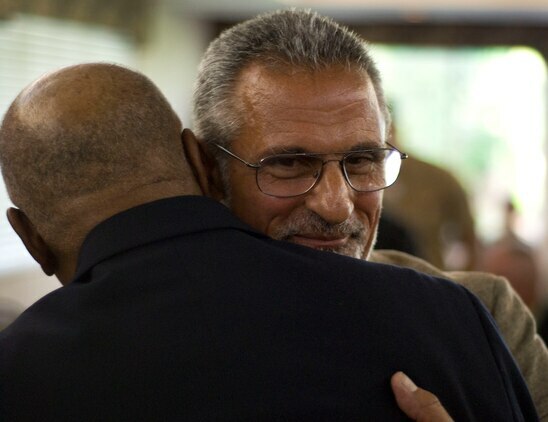 Ron Yerman and retired Maj. James Capers shared a warm embrace after Capers presented Yerman with the Bronze Star Medal with combat distinguishing device during a ceremony at the MacDill Air Force Base officers club Oct. 27. Yerman received the medal for his actions as a sergeant with 3rd Force Reconnaissance Company in Vietnam during a four-day patrol in the spring of 1967. Capers was Yerman's platoon commander and received the Silver Star Medal for his actions during the same patrol. Richard Crepeau beams as retired Maj. James Capers pins the Bronze Star Medal with combat distinguishing device on his chest during a ceremony at the MacDill Air Force Base officers club Oct. 27. 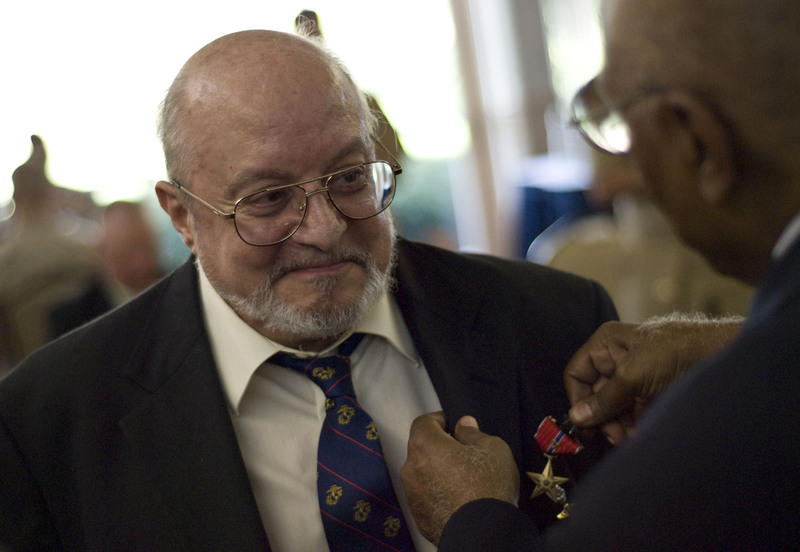 Crepeau received the medal for his actions as a sergeant with 3rd Force Reconnaissance Company during a four-day patrol in Vietnam in the spring of 1967. Capers was Crepeau's platoon commander and received the Silver Star Medal for his actions during the same patrol. Jack Wright became emotional when retired Maj. James Capers pinned a Bronze Star Medal with combat distinguishing device on his chest during a ceremony at the MacDill Air Force Base officers club Oct. 27. Wright was a private first class with 3rd Force Reconnaissance Company when his patrol was ambushed July 29, 1966. Point man for the patrol, Wright was severely wounded by enemy fire. Shouting warnings to his team, he provided suppressive fire against the enemy, killing two enemy soldiers. John Moran beamed after retired Maj. James Capers pinned a Bronze Star Medal with combat distinguishing device on his chest during a ceremony at the MacDill Air Force Base officers club Oct. 27. Moran was a corporal and dog handler with 3rd Force Reconnaissance Company in Vietnam, and he received the medal for his actions during a four-day patrol in Vietnam in the spring of 1967. 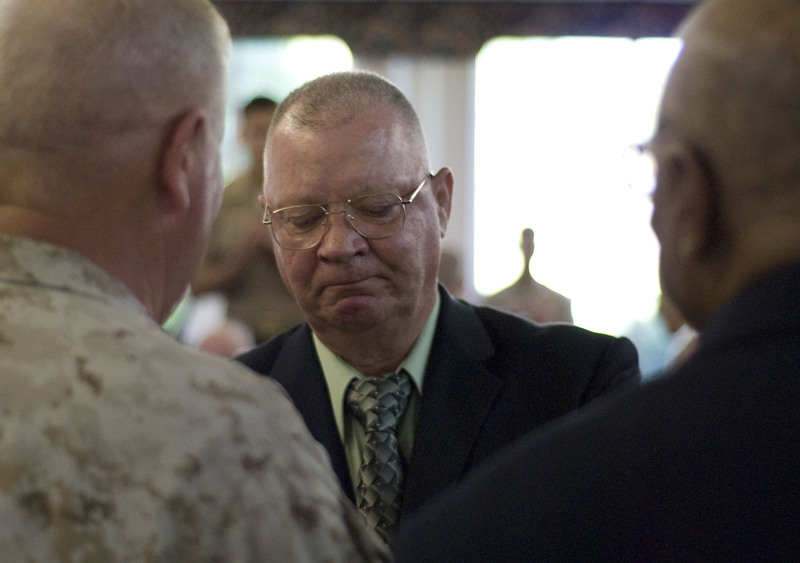 Retired Lt. Col. Gregory K. Manary (foreground) and former Sgt. 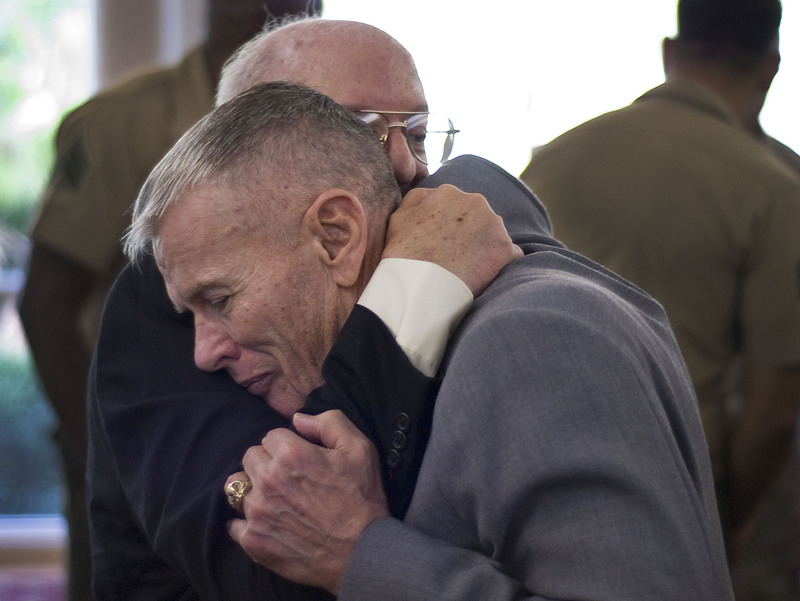 Richard Crepeau, who served together in 3rd Force Reconnaissance Company in Vietnam, share an embrace after an awards ceremony at the MacDill Air Force Base officers club Oct. 27. Crepeau was one of five Marines from the unit who received awards for valor in combat operations conducted more than 43 years ago. MacDill AFB, Florida, USA -- Five Marines and a Navy corpsman who served with 3rd Force Reconnaissance Company, 3rd Reconnaissance Battalion, 3rd Marine Division in Vietnam were recognized with awards for valor in combat operations conducted more than 43 years ago during a ceremony at the MacDill Air Force Base officers club Oct. 27. 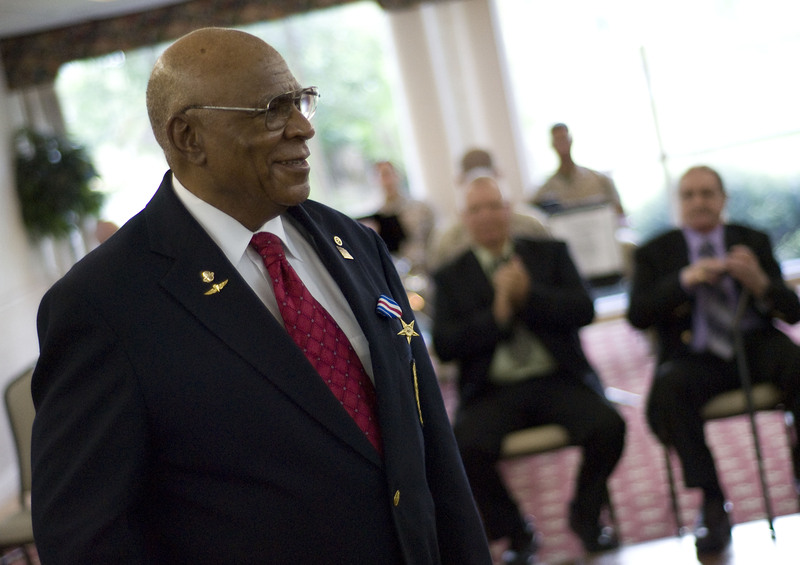 Retired Maj. James Capers was awarded the Silver Star Medal, the nation’s third highest award for valor, for his actions as a patrol leader during a reconnaissance mission in which his team, codenamed “Broadminded,” supported Company M, 3rd Battalion, 26th Marine Regiment, during a search and destroy mission against a suspected regimental-sized enemy force. Four members of Team Broadminded – Ron Yerman, Richard Crepeau, John Moran and Billy Ray Smith – received the Bronze Star Medal with Combat V, a combat distinguishing device, for actions during the same mission. Jack Wright received the Bronze Star with Combat V for his actions on a separate mission. Team Broadminded engaged the enemy seven times during their mission, which took place March 31 to April 3, 1967 in the vicinity of Phu Lac, Vietnam. On the final day, a larger enemy force ambushed the nine-man patrol with small-arms fire and several claymore mines. The team was immediately pinned down, and every member was wounded - most of them severely. Capers, a second lieutenant then, took more than a dozen pieces of shrapnel to his legs and abdomen. Despite his wounds, Capers directed his team to lay down suppressive fire to gain fire superiority and set up a hasty defense. He called for mortar and artillery strikes against the enemy, directed the treatment of the wounded and called for the team’s evacuation, ensuring all his men made it out alive. Maj. Gen. Paul E. Lefebvre, commander of U.S. Marine Corps Forces, Special Operations Command, recounted Capers’ accomplishments as a Marine, a husband, and a father before presenting him with the medal in front of more than 100 guests, including family members and friends of the awardees, several general and field-grade officers, and current members of the Marine Corps special operations community. After thanking the assembled guests and humbly accepting his award, Capers recounted the anti-war culture that was prevalent during the Vietnam era. He spoke directly to the assembled general officers, challenging them to ensure that today’s generation of warriors never have to suffer the bureaucratic failures that plagued the Vietnam generation, such as poor treatment for post-traumatic stress. Capers also spoke directly to his team, commending their service and commitment. “Gentlemen, I thank you so much for your faith,” he said. Lefebvre then joined Capers while he pinned the medals on his Marines. Yerman, a sergeant in Vietnam, served as Capers’ platoon sergeant, assistant patrol leader and radio operator during the roughly 11 months they served together in 1st Platoon, 3rd Force Recon Co., 3rd Recon Battalion, 3rd Marine Division. After Capers pinned the medal on Yerman’s chest, the two men shared a warm embrace. Yerman addressed the crowd, speaking with great reverence about his friend and mentor. Crepeau, also a sergeant in Capers’ team, spoke with great zeal about the bond of brotherhood that exists among men in battle. Crepeau also spoke of Capers as an exceptional, selfless leader. Moran, a corporal in Vietnam, was Team Broadminded’s dog handler. King, the team’s scout dog, was the only team member killed in action in the ambush at Phu Lac, and Moran was one of the most severely wounded. Moran beamed after receiving his medal but opted not to speak. Jack Wright was a private first class when his reconnaissance patrol was ambushed July 29, 1966. Serving as point man for the patrol, Wright was severely wounded by enemy fire. He continued to shout warnings to his team and provided suppressive fire against the enemy, killing two enemy soldiers. Wright was overcome with emotion when he received his medal and when he addressed the crowd. “When I went into the Marine Corps and became attached to 3rd Force Recon … [those men] became my heroes,” he said. Smith, a Navy corpsman in Vietnam, was the only award recipient not present. His award was posthumous. Capers described Smith’s service and heroism during the ambush at Phu Lac. “Most of us would be dead today if it had not been for Billy Ray Smith,” he said. For all of the awardees and their fellow Marines from Vietnam who came from all over the country to attend the ceremony, the event marked a day of healing and release after 43 years.